Cut the carrots into 1/2 inch rounds. Put them into a saucepan and add the butter, sugar and salt to taste. Then add enough water to just barely cover the carrots. 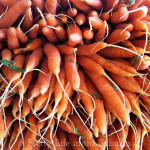 Bring the carrots to a boil, and cook over high heat, stirring occasionally. Cook until the liquid has reduced into a syrup like glaze, and the carrots are tender. This should take about 10-15 minutes. If the carrots are tender, but the liquid is not syrupy yet, remove the carrots (put them in a serving dish) then cook the liquid until it is like a syrup. If the liquid is syrupy but the carrots are not cooked, just add 1/4 to 1/2 cup water and cook until the carrots are tender. When the carrots are done, you can serve them as is, or toss them with fresh herbs.